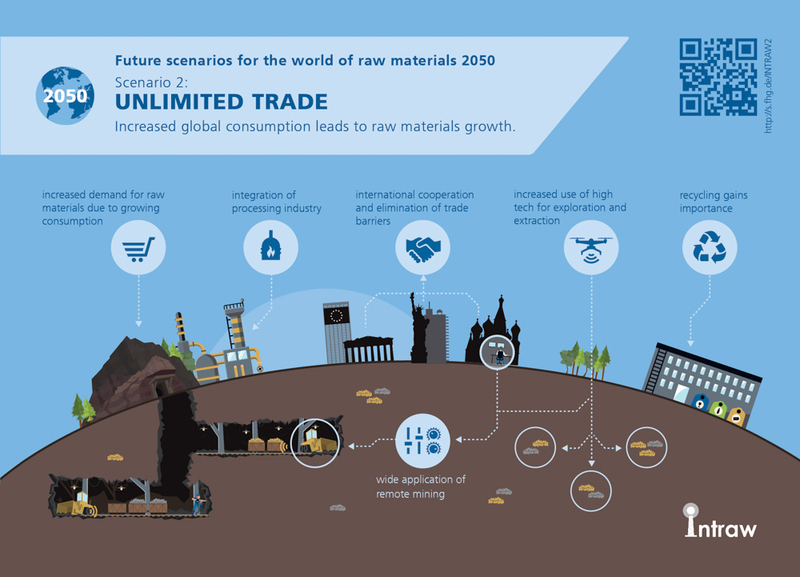 In 2050, the world of raw materials has experienced steady growth, mainly due to ever-growing consumption. International cooperation and dialogue have created new opportunities to produce and trade raw materials. Access to capital has led to industry integration, technology development and productivity improvements alike. Increased global consumption leads to raw materials growth. The Growth of the BRICS states has been amplified by other fast-growing economies (Mexico, Indonesia etc.). The world‘s economic giants (the U.S., China and India) have opted to intensify dialogue and to cooperate. As capital is available, the extraction of raw materials goes on and new mines are opened. Secondary raw materials play an increasingly important role, but cannot satisfy total demand. Positive public image of mining – it is regarded as a diverse and high-tech industry. Technological progress has many effects (better exploration, higher automation, reduced need for energy & water, mining of previously sub-economic mines). Stakeholders in the raw materials business have learned from the ups and downs in the raw materials industry, which has experienced a number of shocks in the 2000 and 2010s. The growth of the BRICS states has been amplified by other fast-growing economies (Mexico, Indonesia etc. ), which entered the material-intensive development phase. While economic growth is not steady, the total demand for raw materials increases as the world population growths. Under the pressure of large multi-nationals, the world‘s economic giants (the U.S., China and India) have opted to intensify dialogue and to cooperate rather than to pursue their self-interests only. They foster constructive relationships with countries that possess critical raw materials. Long-term trade agreements secure access to raw materials. Measures have been taken to regulate speculation with raw materials and to increase transparency. For instance, comprehensive inventories for primary and secondary raw materials have been established. Advanced economies are able to keep growth rates at 2% due to high levels of consumption. It is a win-win situation for both governments and the mining businesses, as total employment in mining has gone up, too. As capital is available, the extraction of raw materials goes on and new mines are opened. Virtually all countries have introduced more efficient regulatory frameworks that support governmental bodies, industry, local communities and other stakeholders to resolve conflicts and to reach a consensus on establishing new mines in shorter periods of time. Most countries have established stable tax regimes as part of the agreements between governments and the mining industry. Secondary raw materials play an increasingly important role in the provision of raw materials. However, the rate of recycling cannot keep up with the total demand. It has reached a plateau. The mining industry and governments have invested heavily into shaping the public perception of mining. People now have a much more positive picture than some decades ago, mainly due to a better understanding of the contribution of mining to sustainable development. The absence of significant mining accidents and the implementation of higher environmental standards (e.g. reduction of energy consumption, less pollution) has contributed to increased acceptance. Student interest in mining increases. Mining is regarded as a diverse and high-tech industry, requiring advanced skills in geology, engineering and business. In the advanced, resource-rich countries it is not the blue-collar workers that dominate mining anymore. To achieve economies of scope, we observe a growing trend towards horizontal and vertical integration. The big mining companies have absorbed a range of suppliers (and their technologies) to enable what was once called “Mine of the Future”. Most mines are now partly automated to reduce costs. Sites that were previously considered sub-economic are now found feasible due to advanced technology. Better technology has led to a dramatic reduction of the (relative) need for energy & water. Technology now allows to mine in remote and off-shore locations at reasonable costs. Significant technological progress also happens in downstream processing technologies and in recycling. Advanced mining technology spreads increasingly fast across borders as good practices are shared. This happens even in less developed countries, where manual labour is relatively cheap. Environmentally-friendly mining and extraction of raw materials, with strict environmental policies in the mine closure period that are followed around the globe have been strongly integrated. Effective recycling processes have substantially lowered the impact of the wider mining sector on the environment.